Pascale Bastianelli will help you to discover Easter traditions at Craft Industry House, a beautiful exhibition place that is situated at Cours d’Estienne d’Orves, 21. (Russia seen by an inhabitant of Marseille). 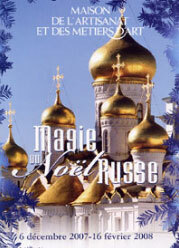 the Cross year: Russia in France and France in Russia – 2010. As a prelude to the Cross year of Russia in France, Russian Christmas in Nice, installed in the heart of Place Masséna, is organized by Tourist Office, in collaboration with the city of Nice. Something new for this year, three cottages will be allotted to an exhibition on Russia, its culture and its traditions. Please find the collection of the Gallery in the window of Tourist Office of Strasbourg and its region, as well as a cottage at the Christmas Market located on the Place de la Cathédrale. You can find the novelties of this winter. Absolutely « must see » for those who are in the region of Marseille. A really magical exhibition on 500 m2. in this beautiful place at Cours d’Estienne d’Orves, 21. A scenography for dreaming… 400 characters represent a Russian village of the end of the XIXth century. Look at the video report realized by the city of Marseille. and Great Exhibition in the windows of the Chamber of commerce and industry of Strasbourg.